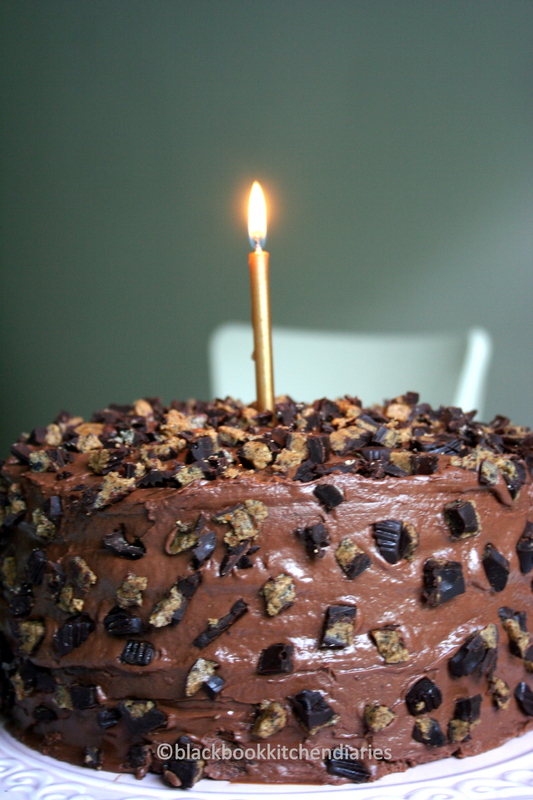 I baked this cake today for a serious chocolate and peanut butter freak. It was requested by the birthday boy himself. 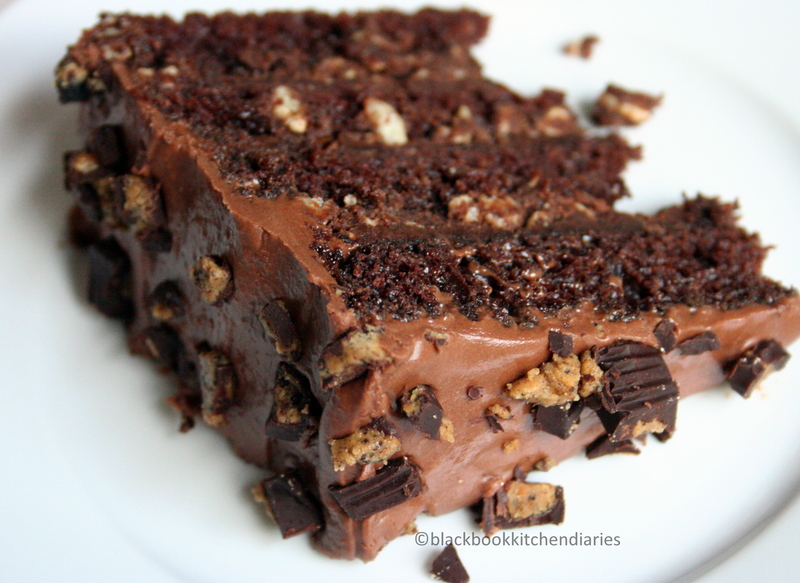 This cake is so rich, decadent and really intense. I love the combination of the sweetness from the chocolate and saltiness from the peanut butter. It is just heavenly where all 3 elements in this cake just complement each other so well from the cake to the filling to the frosting. My kitchen was in a state of mess all in the name of cake. But that didn’t matter, because of the lovely aroma of chocolate and peanut butter I am all giddy with excitement. In my book, this is still under the research and development stage. I basically just whip it as I went along. The thing is, I had some plans on how I wanted this to turn out but as I was measuring and whisking, I got carried away and just did whatever came naturally. That’s right; I was busy playing pastry chef. I was experimenting and yeah, I had so much fun – maybe a little too much. I baked 4 layers of my favorite rich moist chocolate cake in an 8inch cake pan. Let that cool and then filled those layers with chocolate peanut butter ganache. Then, frost it with chocolate peanut butter frosting and then sprinkle it with crushed peanut butter cups. Just go crazy with that. There are no rules. This cake taste just like a giant peanut butter cup candy. It is really intense that you might want to have a slice of this with a glass of cold milk or ice water. I wish I was this lucky on my birthday. The picture of this cake sends shivers up my spine. Where can I get one? OMG! That looks amazing, birthday boy is very lucky. I loved your site by the way. i’m the king of serious peanut butter chocolate freaks… just sayin’. that looks amazing. Thank you for your comment on our blog! I’m so glad you liked the cookies!! Your blog is adorable and this cake looks amazing! 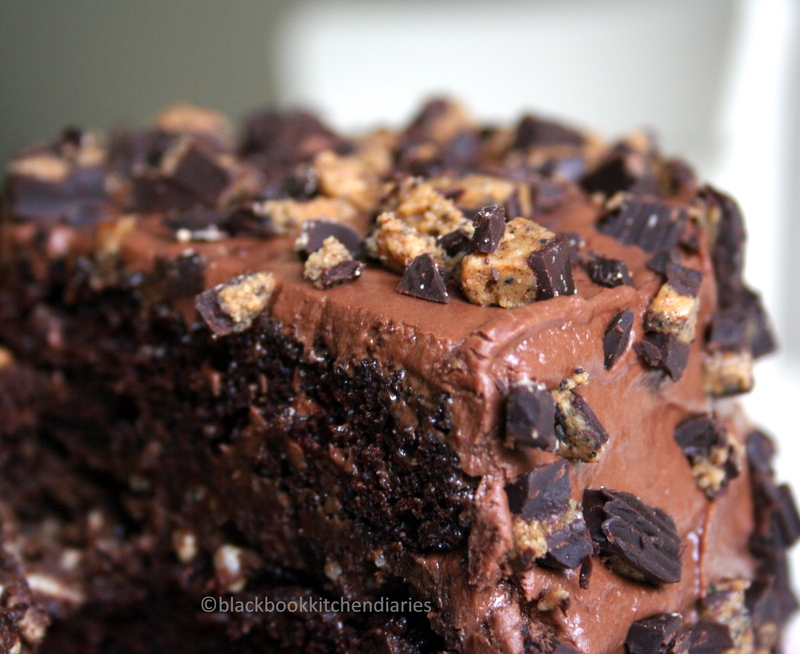 Chocolate and peanut butter are two of my favorite things, I can only imagine how good this cake tastes!